You invested thousands of dollars to rank on Google. And it worked. You rank higher than your competition for several top keywords. Your organic search traffic is going through the roof. You are in lead conversion heaven. Until now—you made one tiny huge mistake: you neglected the mobile version of your site. Most of us in the digital space have heard the statistic that 90% of the world’s information was created in the past two years. It is a great illustration of the immense challenge that Google is facing to pursue their goal of cataloging all the world’s information. They have made significant progress, but the definition of “information” is expanding. “Information” according to Google, now includes songs, movies, TV shows, apps, recipes, books, and just about anything else you can think of. Google wants to know, not just that the information exists, but exactly what it is and how to access and present that information on a variety of devices and in a variety of formats, not just limited to visual presentation in a browser. 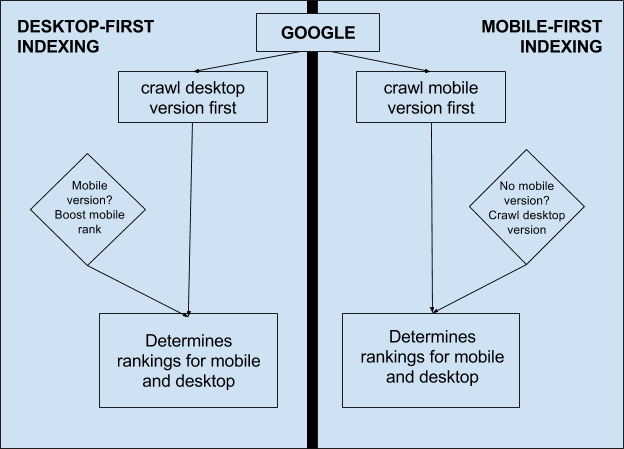 Mobile-first indexing is exactly what it sounds like: it just means that the mobile version of your website becomes the starting point for what Google includes in their index, and the baseline for how they determine rankings. If you monitor crawlbot traffic to your site, you may see an increase in traffic from Smartphone Googlebot, and the cached versions of pages will usually be the mobile version of the page. It’s called mobile-first because it’s not a mobile-only index: for instance, if a site doesn’t have a mobile-friendly version, the desktop site can still be included in the index. However, the lack of a mobile-friendly experience could impact negatively on the rankings of that site, and a site with a better mobile experience would potentially receive a rankings boost even for searchers on a desktop. 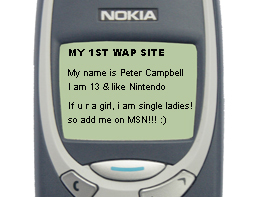 Make sure the mobile version of the site also has the important, high-quality content. This includes text, images (with alt-attributes), and videos—in the usual crawlable and indexable formats. Structured data is important for indexing and search features that users love: it should be both on the mobile and desktop version of the site. Ensure URLs within the structured data are updated to the mobile version on the mobile pages. Metadata should be present on both versions of the site. It provides hints about the content on a page for indexing and serving. For example, make sure that titles and meta descriptions are equivalent across both versions of all pages on the site. No changes are necessary for interlinking with separate mobile URLs (m.-dot sites). For sites using separate mobile URLs, keep the existing link rel=canonical and link rel=alternate elements between these versions. Check hreflang links on separate mobile URLs. When using link rel=hreflang elements for internationalization, link between mobile and desktop URLs separately. Your mobile URLs' hreflang should point to the other language/region versions on other mobile URLs, and similarly link desktop with other desktop URLs using hreflang link elements there. Ensure the servers hosting the site have enough capacity to handle potentially increased crawl rate. This doesn't affect sites that use responsive web design and dynamic serving, only sites where the mobile version is on a separate host, such as m.example.com. To understand more about how Google determines the mobile content from a site, see their developer documentation. It covers how sites using responsive web design or dynamic serving are generally set for mobile-first indexing. For sites that have AMP and non-AMP pages, Google will prefer to index the mobile version of the non-AMP page. If your new web pages do not pass this initial evaluation, they may not be included in Google’s index, and remember, if a webpage is not included in Google’s index, it has absolutely no chance to rank at all. Don’t fret though. Google won’t overwrite well-indexed desktop content with mobile content that has fewer ranking signals and less information. Again, that would be mobile-ONLY indexing, which is not what Google is announcing. If your website is indexed now, it will probably remain in the index, especially if it is are part of the 80% of the web that met the basic requirements to receive the now-hidden Mobile-Friendly designation. Huge amounts of data and information that is not HTML formatted is processed in the background of the Internet. This type of information is becoming critical for the Internet of Things (IoT) and Big Data style calculations. It is accessible only through API’s and direct access to the databases, and Google wants to be able to leverage this information in their algorithm. Beyond that, mobile operating systems and the browsers are getting less distinct. Both Spotlight Search and Google Now on Tap are aspects of the mobile OS that can search content from the web and apps. In the case of Google Now on Tap, it appears that content is provided in feeds and APIs, without necessarily including a web page or URL. Once the URL requirement is removed, content from apps can compete with websites, which makes for a much better experience that has much more flexibility in terms of how and where information can be presented to a user. 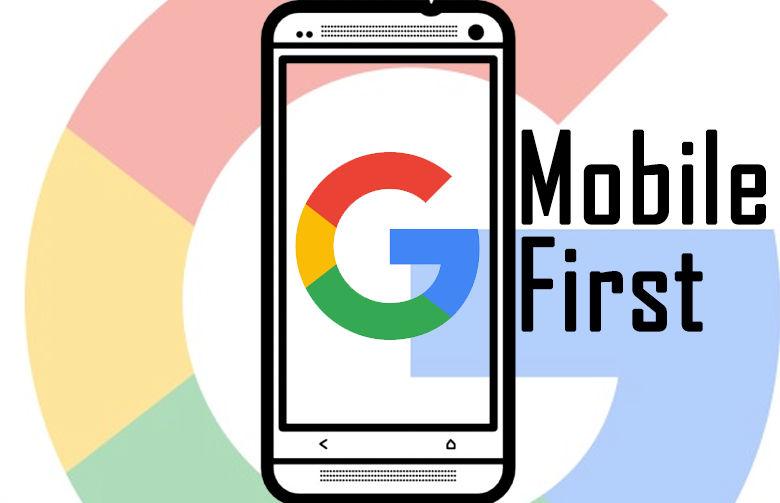 A Mobile-First Indexing mentality allows Google to further distance rankings from simple URLs and links, and focus more on things important to mobile experiences, like speed, rendering, and engagement. The internet is changing. As technology expands and improves it is becoming more and more invisible. As more of our daily devices go online, they become less reliant on screens, browsers and direct-entry keyboards, and instead are all operated remotely from the cloud. Both Amazon Echo and Google Home let you control web-connected elements of your home and perform simple searches using just your voice, and they respond based on streams of data from the cloud. These devices can and do operate without the use of URLs, so Google must also begin to operate in a more presentation-agnostic way. Our devices are moving away from needing browsers, so Google’s index should not be organized based on URLs. Having trouble with the mobile version of your site? Contact us using the form below, and one of Armor’s highly-trained web developers can help.